I purchased my Leonardo from the Casa della Stilografica shop, which was founded in 1944 by Antonio Sacchetti. Today, Marco Moricci, Antonio’s grandson, along with his father, Vittorio, and mother, Patrizia, run the shop. 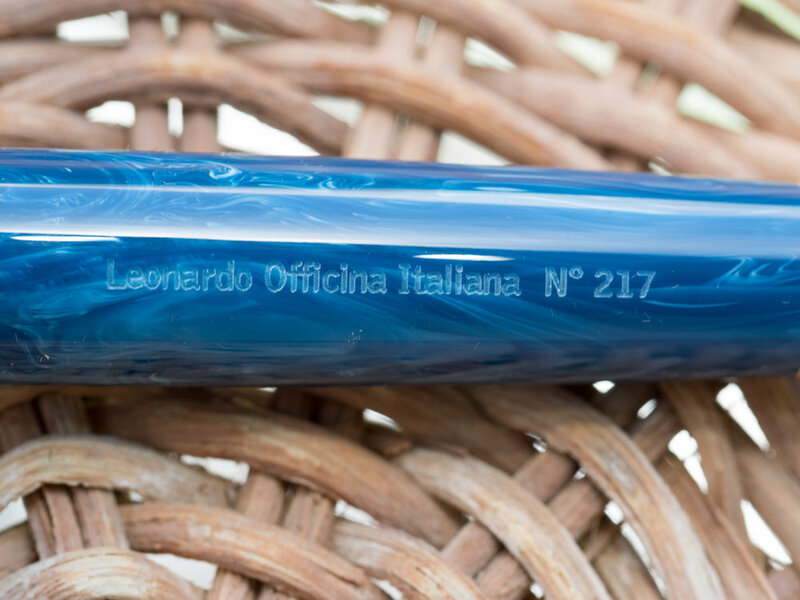 When I saw photographs of the new Leonardo Officina Italiana fountain pens, I was impressed. I read a review in which the writer had purchased one of the celluloid models and one of the resin models. The celluloid models come with 14k gold nibs whereas the resin ones have steel nibs. The reviewer said he couldn’t tell the difference between the 14k nib and the steel one—that’s how good the steel nibs are. 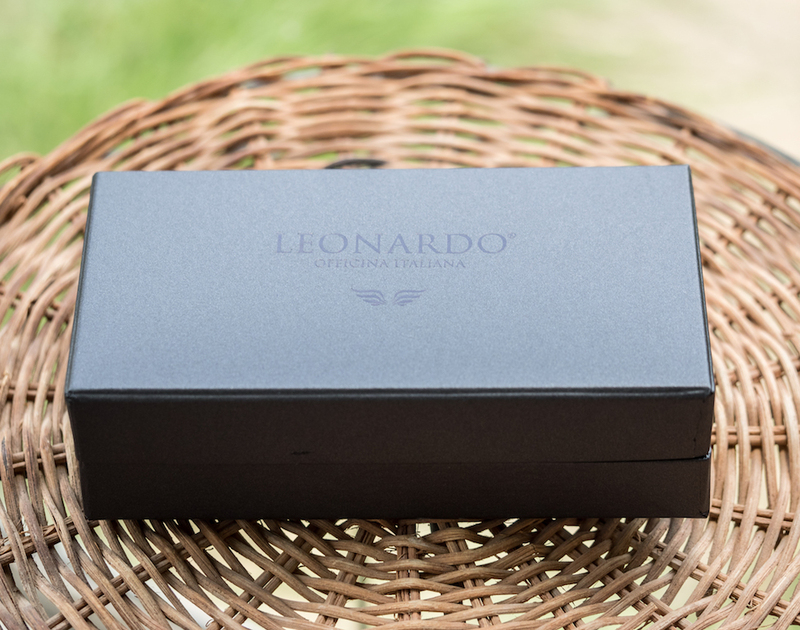 The Leonardo Momento Zero comes in a classic black box with the company’s logo on the top. 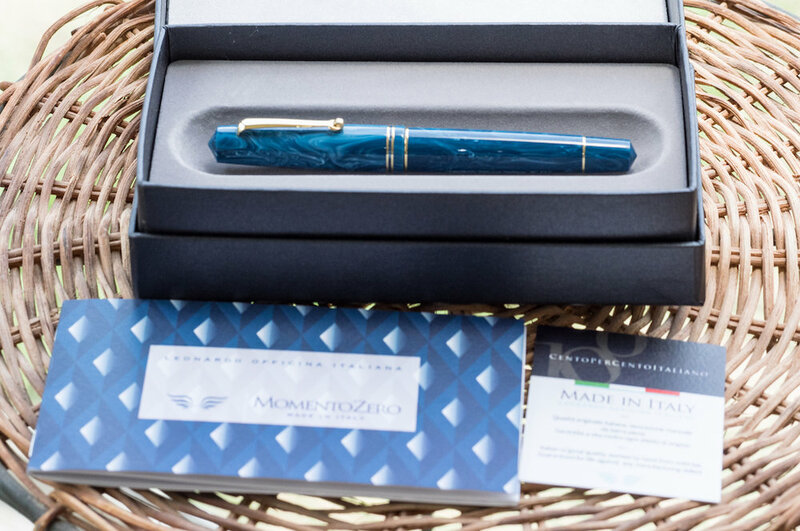 Inside, you’ll find the pen, a pamphlet, and a card certifying that the pen was made in Italy. Although initially I was tempted to buy one of the Abyss Celluloid pens, I decided to try a resin model first. I chose the Momento Zero Positano turquoise. Positano is a town on the Amalfi Coast in Italy, and I assume the color is meant to mimic the beautiful sea coast near the town. Although the color is called “Turquoise,” in person it’s more of a cerulean blue. I matched it with Iroshizuku Ku-Jaku ink and they complement one another perfectly. The resin is absolutely beautiful with swirls of white and blue variations that really do look like ocean water. The pen honestly doesn’t feel like resin—it has more heft to it since the resin is impressively thick. This is no cheap plastic pen; it exudes quality. It’s a large pen: 5.6 inches/142mm closed, 5.08 inches/129mm uncapped, and 6.7 inches/170mm posted, but it is not as thick in diameter as, say, a Montblanc 149. 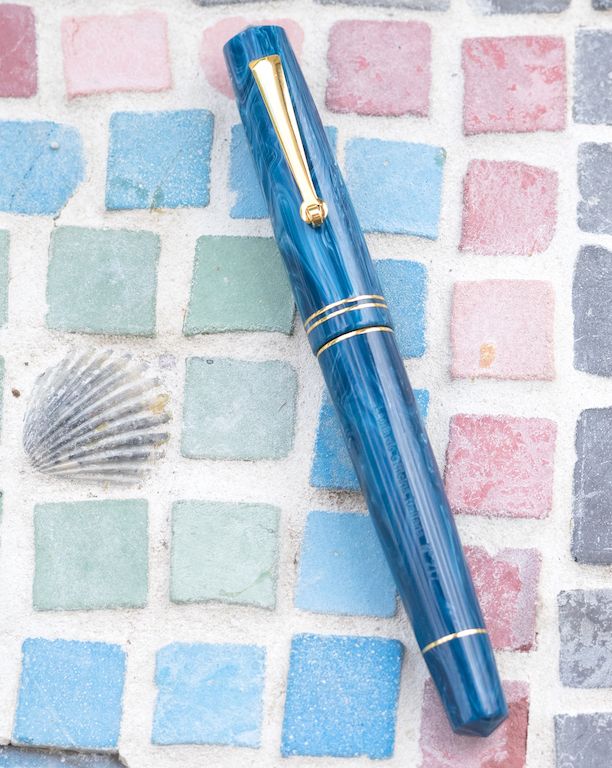 Beautiful details set this pen apart. Both the cap finial and the barrel bottom are conically shaped rather than flat. The clip looks very Omas-like, with a roller ball that aids in slipping the clip onto a pocket or a stack of papers. The cap is adorned with two thin gold bands. 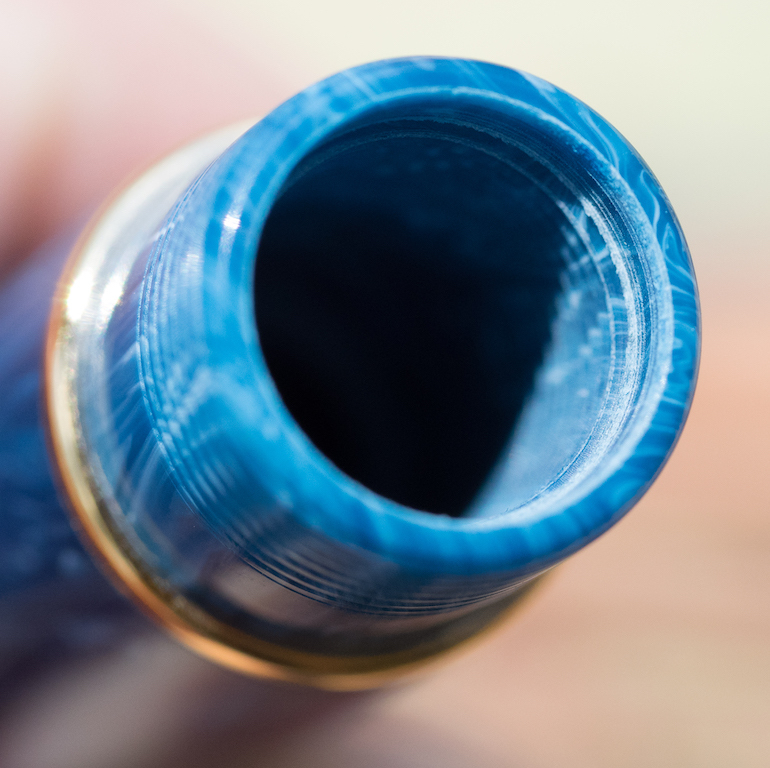 The barrel also sports a gold band where the barrel meets the cap and near the bottom of the barrel. These details make the pen look super classy. The company’s name is inscribed subtly on the pen’s barrel along with the number of the pen. Mine is number 217. The pen comes with a custom Leonardo converter that is especially nice. It screws in to the grip unit and is very well made. The nib is gold-colored steel. I chose a stub nib and had to wait a little longer for it, but it was worth it. The nib is engraved with “Leonardo Officina Italiana” the Leonardo logo (outspread wings), and the nib size. The stub nib offers really nice line variation and is smooth and trouble free. It writes better than some of my solid gold nibs, although occasionally I’ll hear a little scratchy sound as though there’s an errant piece of metal hitting the paper. I’ve checked the nib thoroughly and can’t find any abnormalities in the nib, so it may just be the angle I’m holding the pen. Regardless, I love how this pen writes. I am thoroughly in love with my Leonardo Momento Zero pen. It is extremely well made and it feels like it will last forever. You can purchase the resin models in a variety of colors: turquoise, red, blue, brown-gold, red-gold, matte black, blue-gold, deep blue-gold, and brown vintage. The base price if you purchase directly from the Stilografica shop is €121.31 excluding VAT. The Leonardo Momento Zero pen is immaculate. The resin is beautiful and the trim makes for a classic look. I really like the quality of the custom convertor that comes with the pen. The steel stub nib on this pen is simply fantastic. It offers excellent line variation and smooth writing. Depending on the exchange rate, €121.31 translates to about $140.00 (plus shipping). I think this is an excellent price for such a well made pen. I usually find some factor that detracts from fountain pens I review, but in all honesty, I am completely satisfied with my Leonardo. I highly recommend this company and the pens they make in house. Posted on August 10, 2018 by Susan Pigott and filed under Leonardo, Fountain Pens, Pen Reviews.